Keep Scotland the Brand is a positive, inclusive campaign. You can speak out in support of Scotland’s farmers, fishermen, distillers, Scotland’s producers, Scotland’s economy: people who have worked successfully for decades to build up Scotland’s reputation as a quality brand which can be trusted. Please contact supermarkets, retailers, and manufacturers asking them to support Scotland’s brand identity and not to hide the source of our goods under a homogeneous ‘British’ label and flag. Clear provenance does not require flag-waving, it requires prominent labeling. Potatoes are just one example of why Scotland’s brand matters. Scotland’s farmers grow 80% of the seed potatoes exported from the UK. Read more here. Farmers around the world specifically choose our produce. Scotland’s soil and the diligent work of farmers and Scottish scientists combine to create a product recognised for its quality across the world. If our potatoes are branded ‘British’, Scotland loses that international reputation, it loses market share, we lose jobs. The threat of leaving the Single Market and tariff-free trade presents a particular threat to Scotland’s farmers. Seed potato exports to Morocco, currently possible as part of EU-brokered trade deals through our membership of the Single Market, would be hit with tariffs of 40%. The reality is, no matter how excellent Scotland’s seed potatoes are, a 40% rise in costs will mean our exports are no longer competitive. The Scottish Select Committee heard evidence about this from Scotland’s farming, food and drink leaders. The cross-party group of MPs were told loss of Single Market access would be a ‘nightmare scenario’, ‘catastrophic’, and ‘game over’. When asked about DEFRA’s ‘Great’ campaign – the reason why union flags are to be found on our food and drink, with local provenance disappearing under the blanket ‘British’ label – James Withers, CEO of Scotland Food and Drink, told the committee it ‘rides roughshod’ over the decades of work Scotland’s farmers, fishers, food and drink producers have put into developing Scotland’s globally-recognised brand. Watch the session here. 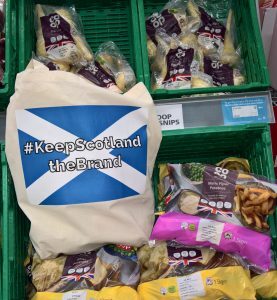 If you see an item, photograph it, share it on social media, contact the supermarkets, the retailers; use the hashtag #keepScotlandtheBrand. Share any responses you get. Ask your elected representatives to speak up for Scotland. 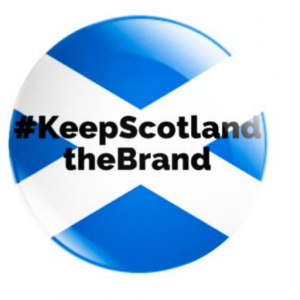 Keep Scotland the Brand is not a boycott campaign. It is a positive move to support the people who put GM-free food on our tables: Scotland’s farmers and fishermen. Scotland’s food standards are amongst the highest in the world. Currently, thanks to EU regulations, it doesn’t matter if you buy a ‘Value’ product or something from the ‘Finest’ range in a supermarket, the standard that food has been produced to is the same. The Americans are demanding the UK lowers its standards to allow their food and drink to be sold here in post-Brexit trade deals. Americans have 40% higher rates of food poisoning per head of population than we do because their industrialised animal husbandry is significantly poorer than the farming and slaughter practices in Scotland. Clear food labelling will be crucial for consumer confidence and choice. Keep Scotland the Brand is a positive campaign aimed at supporting Scotland’s market share in a changing world, to support our food and drink industry, our tourism and hospitality sector, our tweed and textiles base, our distilleries, our reputation as a centre of excellence for engineering, IT, medical, and veterinary sciences, and the many entrepreneurs who keep Scotland’s economy moving. 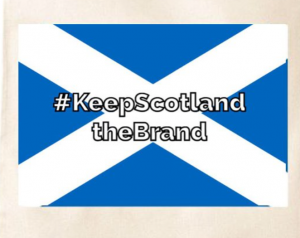 Keep Scotland the Brand is an inclusive campaign. It is for everyone, regardless of their outlook. It grew out of Yes Kirriemuir and Yes Forfar, a non-party political group of people living in the heart of Angus. #keepScotlandtheBrand is not party politics nor is it about the constitution. We are supporting Scotland’s producers because it is the right thing to do. Farmers are our neighbours. Many are our friends. If their businesses are hit, our communities will suffer. If Scotland’s economy is hurt, all of Scotland will suffer. 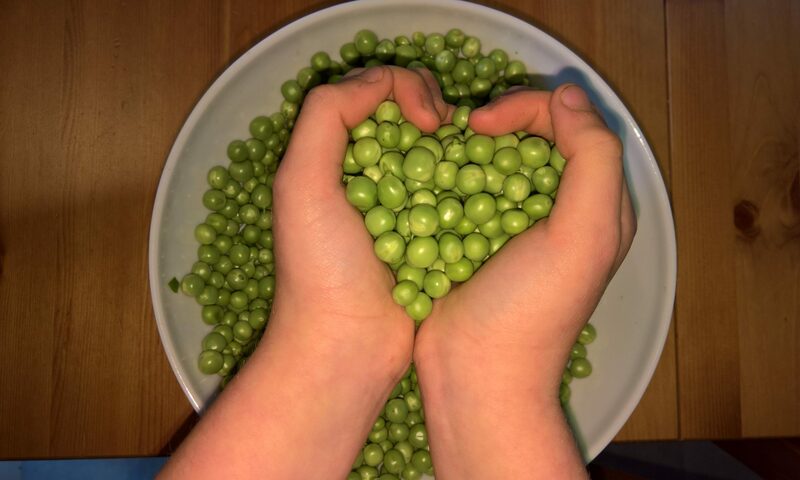 #keepScotlandtheBrand – because we all need to eat. 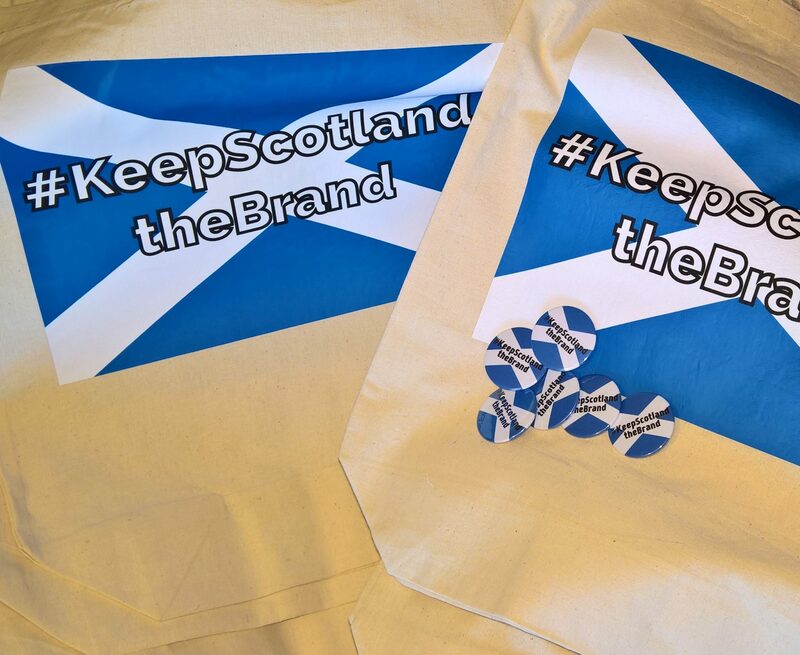 Want to find out more about #keepScotlandtheBrand? This is a recording of the event hosted by Common Weal in Perth, with thanks to Darryl and William, among others. This is similar to the talk given to groups across Scotland, from the Rotarians in Angus to public meetings in Dumfries and Galloway. The questions asked differ according to the perspective of the groups but the answer to one thing is always the same: food is what unites us. This is about the future of our food and drink producers, our economy, and the quality of the food on our plates. The online magazine, UK in a Changing Europe invited Ruth to write an article outlining the reasons why she began Keep Scotland the Brand. The resulting article, ‘Flags on Food, Why the Fuss?’ explains more. You can read it here.